Game update 1.06 is now available for Madden NFL 18. This update includes support for the Xbox One X, gameplay improvements (including pass accuracy tuning), as well as fixes for Franchise, MUT Squads, and more. Continue on to read the full patch notes courtesy EA SPORTS. Madden NFL 18 on Xbox One X delivers the most detailed, highest-resolution Madden NFL game available on console. 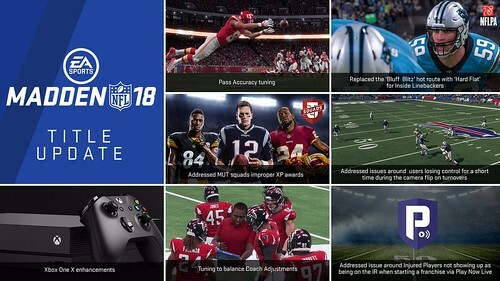 With the power of the Frostbite engine, combined with the advanced technology of Xbox One X, Madden NFL 18 features enhancements that create an absolutely stunning, 4K Ultra HD football Xbox gaming experience for the first time ever. Character Level of Detail: Vibrant, detailed athlete visuals bringing your favorite NFL stars to life! All of this is part of a Title Update for Madden 18. Below are the other features included in this recent update.